Confession: I can’t help hoping that after the wise men of the age have poured enough energy into world problems like war, racism, and poverty, one of them will find a few spare moments to develop a label adhesive that actually removes cleanly from its product. With all our wisdom we have not yet been able to pull this off. I don’t know about you, but for me the national news this summer was exceptionally depressing, between unthinking violence on one hand and thinking legislation on the other. Perhaps this is because I was actually reading the news; I’ve never been much of a political girl. Every few months, I ask my husband Is it time to move out of America yet? Much less than half of me is joking. He always says No, not yet. I find a great split between what I experience locally and what I hear about nationally. I love the people of my town, and I live among them without fear. I don’t worry about theft or violence or child abduction or contamination. The more people I learn to know, the more safe and contented I feel. God’s fingerprint is on them. They are flawed and sinful like me, but His work in us is not done. Most have a strong sense of justice and a healthy dose of common sense. They know that outrageous things are outrageous, and that honorable things are praiseworthy. They would give their right arms to protect me and my children. Nationally, I get the sense that “we the people“ are categorically bad. The morals have slipped, the innocent are exploited, the outrageous is being protected by law. Is this only because the media cherry-picks the most inflammable events for their reports? Or are these signs of national changes that will be felt locally in fifty years? I cannot imagine a nation in which most of the children have grown up exposed to violence, immorality, and broken homes—free to choose their own gender, moral guidelines, sexual orientation, and deity. I think every generation has asked this, but it is my turn now: What kind of a world will my children live in? What do you think? Is there ever a time to leave an ungodly nation? How would you know if that time came? Try lemon essential oils and warm water. For the label that is. I don’t think that will work with our national problems. In leaving an ungodly nation, will we not simply step into another ungodly nation? Yes, my thoughts have been constantly on these things this summer also… I think of Jesus’ words “if they persecute you in one city, flee to another.” I don’t think we are to that point – yet. And Anabaptists came here to America for that reason. There is a Christian radio host that often reminds her listeners, after a string of depressing and horrifying news reports, that Jesus SAID the last days would be like this. And that we are privileged to be here to watch His purposes unfold. This is His time for us to play our role in this act. I feel your angst… I have been dragged into despair myself this summer. But I am hearing God’s promises of restoration lately, stark contrast to the dreadful things on every front and I can’t change much, but I’m changing which voices I’m listening to. I share your feelings on current and future issues. One thought a friend shared with me is that God doesn’t give grace for a future situation that I might be worrying about. But He does give grace for our whatever we’re facing right now. 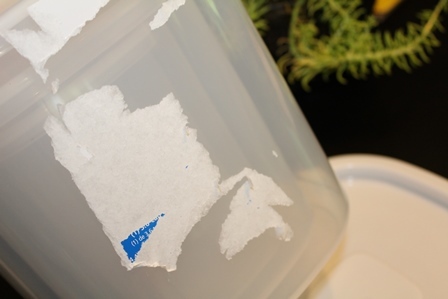 About the labels–if you remove them from plastic containers/bags BEFORE washing, you’ll have better success. Peanut butter smeared on and left set awhile will take care of the stubborn glue. An oil of some sort is your friend when it comes to sticky labels. I like Avon’s Skin So Soft. Our nation is not on a good trajectory, however nice and safe our personal little pocket may be. However, there’s nothing like traveling overseas for perspective. I spent two weeks in Yemen, once upon a time, and when I came back I wanted to kiss the ground, hug the flag, and thank God for the land of the free. I’d say there’s still a work and a purpose for you to do in this country. Also one of my favorite promises: “God is able to make all grace abound toward you, that ye always having all sufficiency in all things may abound to every good work.” I’m trying to memorize that. we’ve just returned from two years in Africa. Two years of bribery, lying, ISIS threats, poverty, glue sniffing children, witchcraft, sexual corruption and mobs. Two years of knowing that you are seen as a rich, white american who is to be taken advantage of as much as possible. A tremendous cloud lifted when we stepped on american soil. Why? So many possible reasons, including personal ones. A big one is because over all, law and order is still respected here. Your neighbor will most likely not be stealing the things off your front porch if you don’t bring them in at night, neither will they be forcing themselves on me sexually because it’s the culturally approved thing to do if i’m a widow. If they do and you turn them into the law, you don’t need to worry that they will bribe the local police to look the other way. Yes, i know about the news here and the riots that happen and the sin and brokenness. And yes, judgment is coming for after all, we believe the Scriptures when it says that to whom much is given, much will be required. (may God help us mennonites! we have been given SO much!) I’m afraid there are not many places, if any, to run too except Jesus Himself. I believe that God has allowed us to be born in this age for a distinct purpose and that’s how we’re trying to raise our family. We’re willing, by the grace of God, to serve Him wherever He needs us. But for now He has called us back here and never before have i appreciated this country like i do now. I agree with a commenter who said she wanted to kiss the ground and hug the flag when she returned from overseas. I wanted to stand and sing the national anthem as we descended into the Philadelphia airport. I don’t really care if the news blows things out of proportion because Jesus has already told us that wars and rumors of wars will be happening. There’s nothing new the world can tell us and eventually america will go the way of all empires. It will fall but as a believer i have my orders handed down to me from the King Himself. Obey His commandments, love my neighbor, and walk without fear. I feel that i need to add a bit more to my comment above. There are beautiful people and situations in third world countries like Africa. I know of stories that leave my mouth hanging open at the beauty. There are beautiful people in every culture but very few have had the opportunities that we have had. Don’t worry. I know that strengths and weaknesses are usually two sides of the same coin… and I hear what you are saying!